Martin G. Craven was born on the 15th of December 1940, at Hoylake in the Wirral, moving from there to Chester and then to Kendal when he was starting third year. He started cross-country at Heversham School when he successfully persuaded the games master that rugby was not his forte (not unusual for skinny runners!) Subsequently he joined Kendal AAC as a youth. Martin first represented Edinburgh University Hare & Hounds in the 1959 Edinburgh to Glasgow Relay and went on to become a ‘blue’ for both cross-country and athletics. After graduating he went to Oxford University for a year and ran in the cross country and track teams. Then he worked and competed in the North of England until 1969 and was proud to wear a Kendal AC vest but maintained second-claim membership of Edinburgh Southern Harriers. During the 1960s he did a lot of road races, building fitness for the longer distances. He was surprised and pleased to win his first marathon (1966 Preston to Morecambe) in 2.24.26; and to regain his title (2.20.58) the following year. Martin Craven’s most notable achievements included running for Scotland in the International CC in 1963; and gaining a GB vest in the 1967 Kosice International Marathon. From 1970 onwards he became a vital team member of the very successful ESH team; improved his marathon PB; and in 1981 won the M40 Scottish Veterans Cross-Country title. Martin continued to race well into his early fifties. It is obvious that his running career explored the full spectrum: youthful exploits, peak performances, maintained competitiveness and eventual retirement while still quite fit in late middle-age. In fact, Martin Craven’s success in achieving his full potential should be inspirational. The Edinburgh University Hare & Hounds regime was legendary. The arrival of Fergus Murray in 1961 triggered harder, faster, longer training which eventually led to an E to G record in 1965 and three victories in a row up to 1967. Although Martin Craven had matriculated in 1959, he did not graduate until 1964 so his training must have been influenced considerably. EU finished 17th in the 1959 E to G, with Martin on Stage Three. In 1960 they improved to 10th (MC fifth-fastest on Stage Five). Martin did not reappear in this prestigious race until 1970 but then ran eleven in succession for ESH. His early cross-country running was inauspicious: 37th in the 1960 Junior National. Next season he did improve to 20th and EU finished third team. Thereafter he must have improved very rapidly, since he was selected for the Scottish team after the Senior National at Hamilton Racecourse on 22nd February 1963. John Linaker, Alastair Wood and Andy Brown were the first three, but Tom Cochrane, Calum Laing, Bert McKay and Martin Craven could not have been far behind. In the International CC Championships at San Sebastian, Martin finished 70th, only two places after Scotland’s sixth counter McKay. A major highlight was the 1967 AAA Marathon Championship on 26th August at Baddesley Colliery, near Nuneaton. Uniquely, Scots won gold, silver and bronze, through the efforts of Jim Alder, Alastair Wood and Donald Macgregor. Martin Craven too placed highly; and he and Donald were chosen by the BAAB to wear their first British vests at the famous Kosice Marathon in Czechoslovakia on 10th October. Olympic Marathon runner Donald Macgregor described this race in his 2010 autobiography “Running My Life”. Anyone interested in Scottish distance running should buy this detailed and fascinating book (email dfm237@hotmail.com). This was the 37th international ‘Peace Marathon’, which continues to the present day. Previous winners included the great Ethiopian athlete Abebe Bikila. There were 130 starters from 13 countries. The following extract is abbreviated. “Martin and I lined up on a damp but warm morning (22-26 degrees C). The traditional course started in the stadium and led through some outskirts of the town to the village of Sena on the Hungarian border some 13 miles away to the east, and straight back again. The route was more or less flat, so that the wind played a prominent role in determining whether or not the times would be fast. In 1967 there was a westerly breeze on the way out, so that the finishing positions would very likely be decided over the second half. A group of 17, including Martin Craven and me, formed from the start and remained bunched together until shortly before the turn. By 20km, reached in around 1.21.00, a cohort of five – Nedo Farcic (Yugoslavia), Meravi (Ethiopia), Craven, and the Soviets Baikov and Sucharkov – had taken 300m off the next group of five, including me. The wind was now behind us and the pace crept up. The leaders reached 35 km in 1.54.22 and Farcic and Meravi managed to break clear from the other three. By the finish Nedo Farcic was away and clear for his biggest-ever win in 2.20.53.8. The Ethiopian followed just over a minute behind (2.21.58.2) and then came a procession of nine further runners all under 2.25, the last being myself in 2.24.54.2. Martin was fourth in 2.23.14.0. Somehow neither of us felt able to do more than just keep going over the last 15 km or so, no doubt because we had not recovered fully from Baddesley.” Nevertheless, Martin Craven had every reason to be very pleased with his GB debut! Martin ran the Seventh Stage in the 1970 Edinburgh to Glasgow Relay. He recorded easily the fastest time and clawed back Shettleston’s lead to sixteen seconds. However Bill Scally withstood the challenge of Kenny Ballantyne and ESH finished second. In 1971 they were third, with Martin gaining five places on Stage Two. By then I was living in Glasgow, running for Victoria Park AAC and before long came into direct contact with Martin Craven. On the 12th of December 1971 I managed to complete an arduous 18 mile Sunday session with Edinburgh University people, including Andy McKean, Jim Dingwall and ‘The Crab’. (This was Martin’s nickname, due to his unusual running style.) My diary notes: “Over road, fence, path, hill, bog, precipice etc.” Thereafter, whenever I went to Edinburgh for a weekend, I often trained with Martin, who seemed to wear lightweight Tiger ‘Cubs’ (costing 29/6!) on all occasions, amazingly without incurring injury. On 1st January 1972 Martin was 8th in the Morpeth to Newcastle Road Race, while I could only manage 16th, a minute adrift. Yet in the National CC at Currie I managed to finish comfortably ahead of him. In November 1973, ESH won the E to G, after Martin Craven moved into the lead on Stage Five, recording the fastest time. I was teaching in Sweden by then but moved to Edinburgh in August 1974 and joined ESH. Immediately our rivalry was renewed, when on the 25thof August at Meadowbank on a wet and windy day, I only just got the better of Martin to win an inglorious SAAA Track 10 Miles Championship. However on 21st September he outkicked me by one second to win the Millport 10 on the island of Great Cumbrae. For the next seven years we were team-mates and friendly near-neighbours, frequently training together on Sundays (long run), Mondays (short rep session) and Wednesdays (longer reps), as well as battling out many close races and sharing team triumphs. In the E to G, ESH won in 1974, 1975, 1977 and 1978, as well as finishing third in 1979 and fourth in 1980. As mentioned previously, Martin Craven ran eleven races in a row and won five gold medals, one silver and three bronze. He always made a valuable contribution but personal highlights were in 1975 and 1977. In the former, we broke the race record and were ahead all the way, with five fastest times, including Martin Craven’s record-breaking 20.42 on Stage Three, which increased our lead from three seconds to one minute 51 seconds! However Martin’s Stage 8 performance in the latter year was even more vital. We were without Alistair Blamire and Allister Hutton, and yet somehow ground out another victory. Ron Marshall’s report in the Glasgow Herald bore the headline “Craven courage on final leg of relay”. He wrote: “In one of the closest finishes for many years, Edinburgh Southern Harriers triumphed in the 37th Edinburgh to Glasgow Relay yesterday. Edinburgh AC were bridesmaids for the fifth year in a row and Shettleston, the holders, were third. In the National Six-Stage Relay, Martin helped ESH to win gold medals in 1979 and 1980. One might assume that the National CC Relay would be a little short for Martin Craven but in 1976, with the additional assistance of Ian Elliot, Allister Hutton and Alistair Blamire, ESH won the event. In the National CC between 1973 and 1980, Martin won no less than eight team medals in succession with ESH: two gold, five silver and one bronze. His best individual placings were 12th in 1975, 14th in 1974 and 18th in 1976. In total, he won ten SCCU team titles. On the track, Martin Craven’s fastest 5000m was 14.32.6, when he won at Meadowbank on 14th April 1973. He followed that with a 10,000m PB of 29.55.4 at the same venue on 16th June. Then in 1975, when he was especially fit, he ran 49.40 in the final SAAA 10 Mile Track event for a meritorious third place behind Doug Gunstone (48.55.4) and myself (49.00.8). His fastest Scottish Track Ten was actually 49.19.6 in 1973, when he was third after a close contest with the winner Doug Gunstone (EAC) and Colin Martin (Dumbarton AAC). After his excellent races in 1967, Martin Craven returned to marathon running in the 1970s. He ran 2.21.05 when sixth in Manchester in 1970; 2.22.11 in the 1971 Maxol; and was fifth in the Scottish rankings with 2.20.35 in the Maxol in 1972. 1973 produced 2.22.03 at Harlow; and 1974 2.26.07 at Windsor. However his fastest time was an impressive 2.18.38 when 11th in the AAA Marathon at Stoke on 1st June 1975. This made him third in the Scottish rankings. In addition he was picked (for Borders Counties) to run in the English Inter-Counties 20 mile road race, finishing second in an excellent 1.41.30, followed by future GB Marathon International Dave Cannon (3rd) and John Hillen (12th) which gave Borders the team title. After this, Martin continued to battle occasionally with the classic distance, finishing with 2.25.01 when sixth in the 1979 Glasgow Marathon; and 2.31.55 as a veteran in the inaugural 1981 London Marathon. 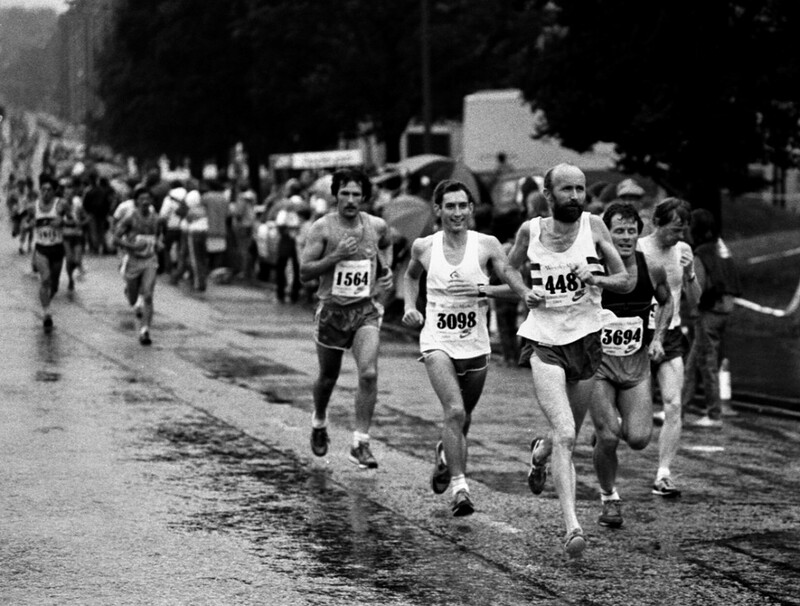 By then, Martin Craven was the 1981 Scottish Veterans Cross Country Champion. He continued to compete well until he was over fifty years old, retiring as a well-respected, popular runner with every reason to be proud of his outstandingly consistent, successful running career.